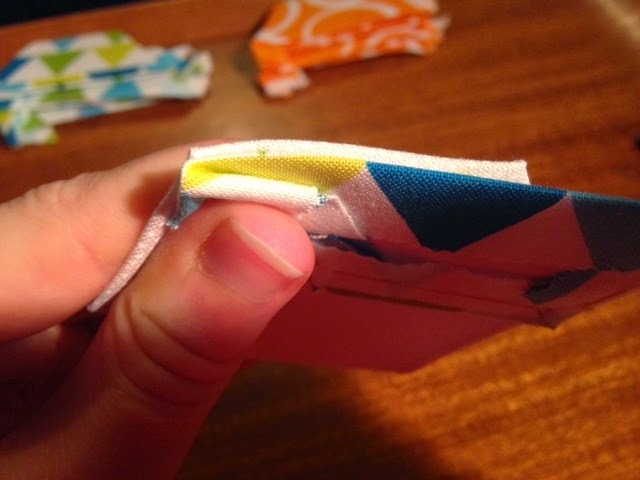 You will notice it is the same shape as the trapezium with a rough seam allowance - I actually made the height the same as the jelly roll so that I reduced the amount of waste and gave them a uniformed look. 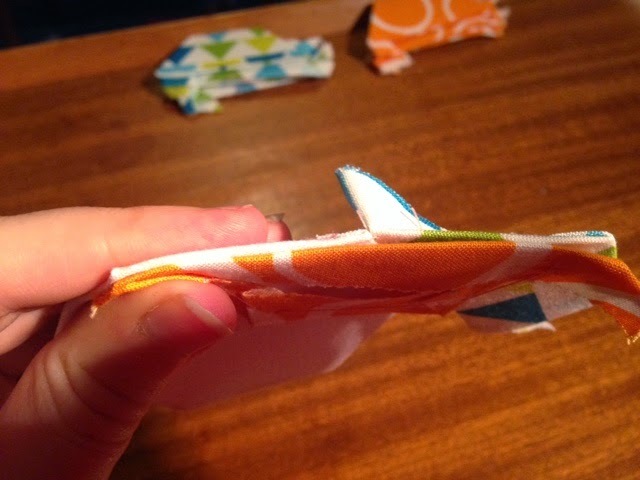 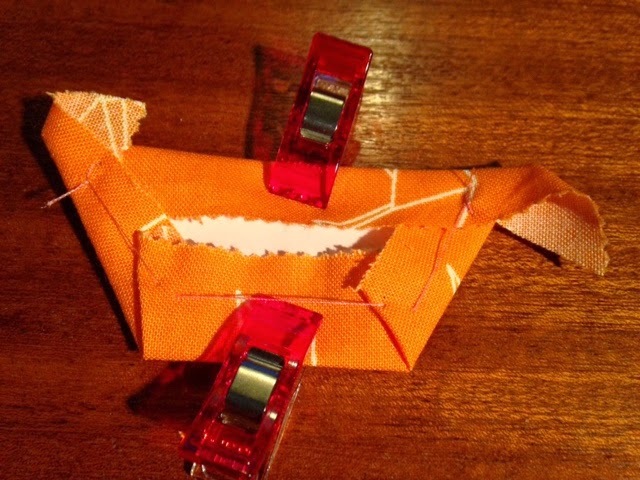 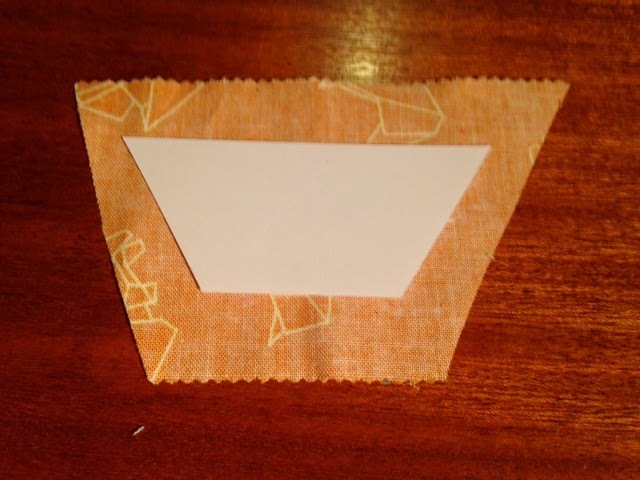 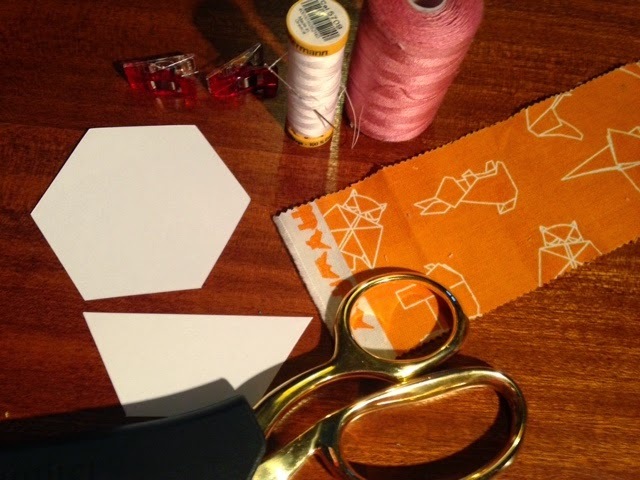 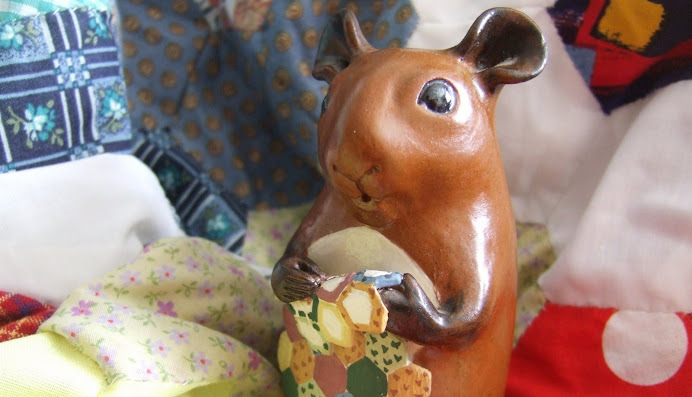 Make a tacking stitch through the corners of the shape, ensuring that you carefully fold the fabric down around the paper to create a very crisp edge. 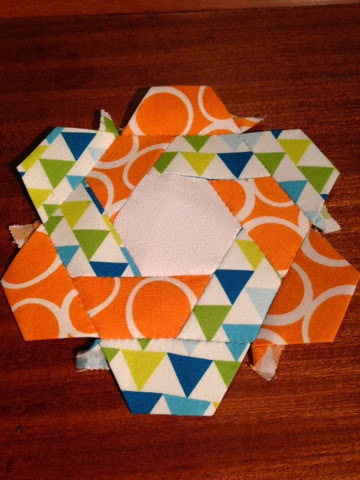 Once complete it should look like this. 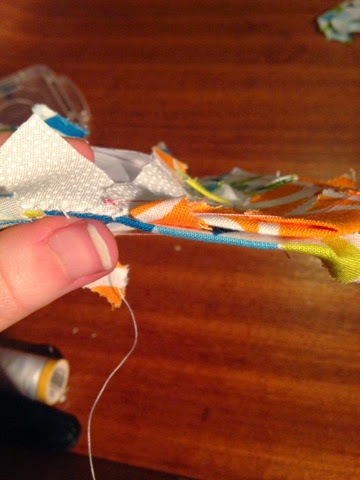 Remove the clips and ensure that the shape on the front is as the paper template was. 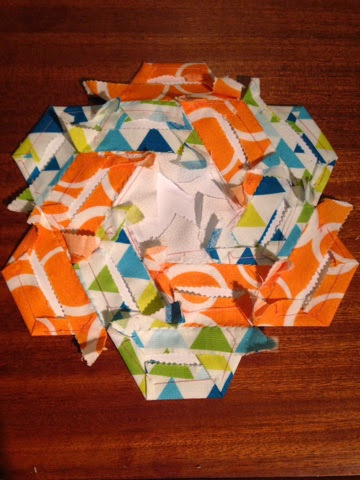 You're going to want to work on these in a circular motion - because of the way I have laid these out I need to sew anti clockwise. 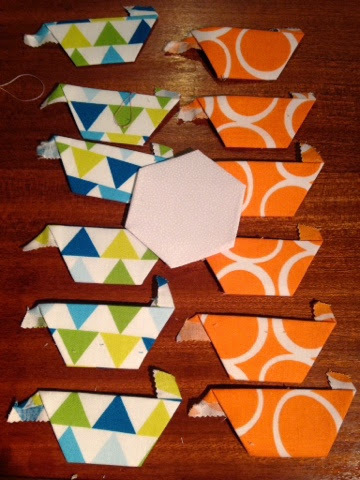 You will want to work on the pieces one at a time, so take your pick which one. 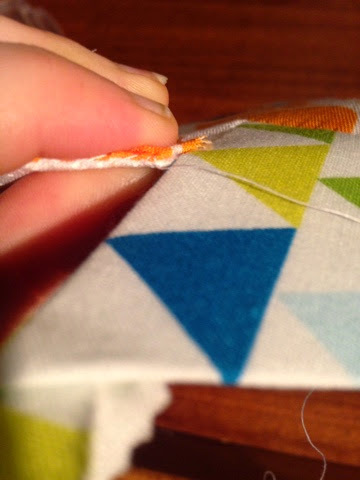 Slip or whip stitch along this edge. 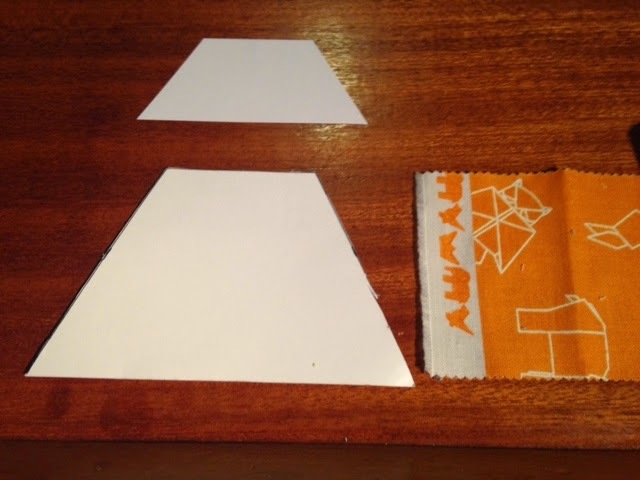 Take your second trapezium (remember I'm working anti clockwise) you want to take the trapezium that will mean you're seeing along straight edges. 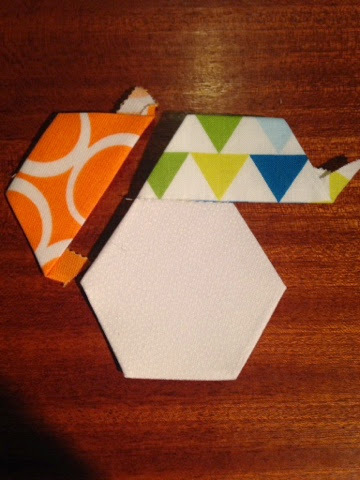 Pop right sides together again and ensure that the trapezium edge is the same length as the length along the hexagon and trapezium that are already attached. 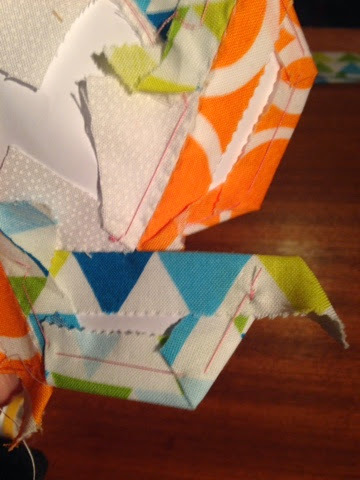 This last one is the most complicated part of the entire block - but honestly this isn't that difficult either. 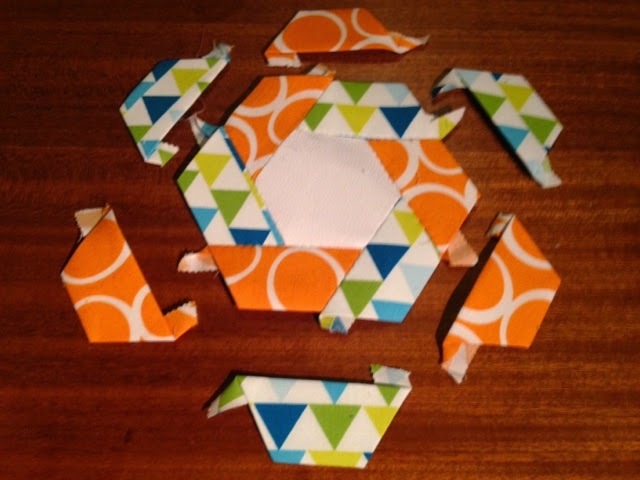 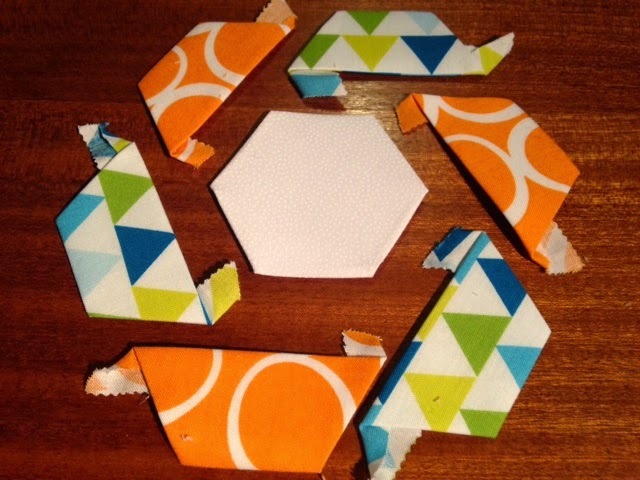 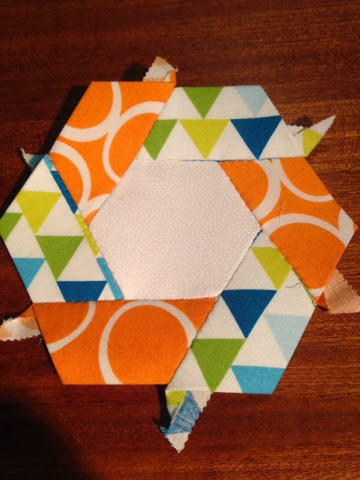 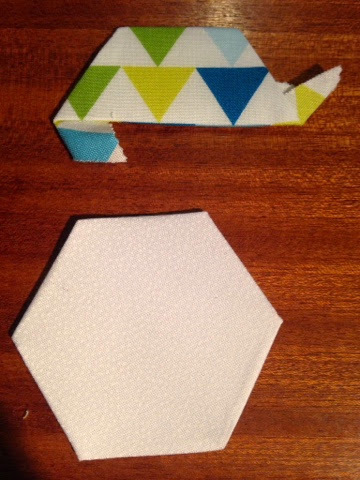 We're going to start sewing along the same edge that we have used for all the rest of the blocks , however in the photograph below I flipped the pieces over so that the trapezium I'm attaching is ontop of the hexagon undeneath. 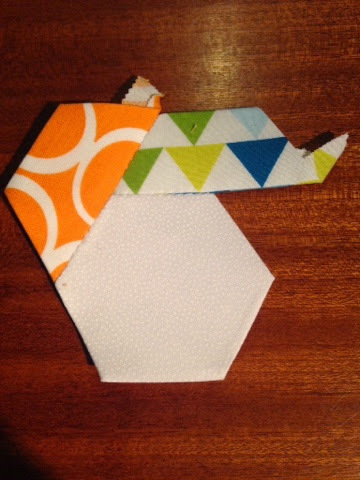 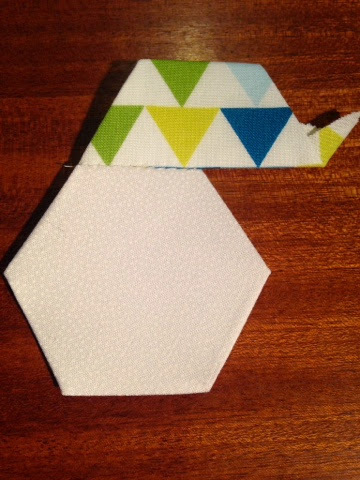 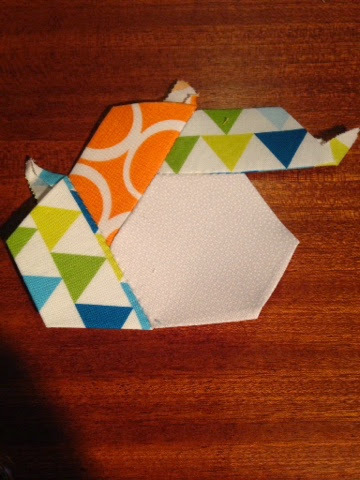 Sew as before from the left edge up to the point where the other trapezium is attached to the hexagon. 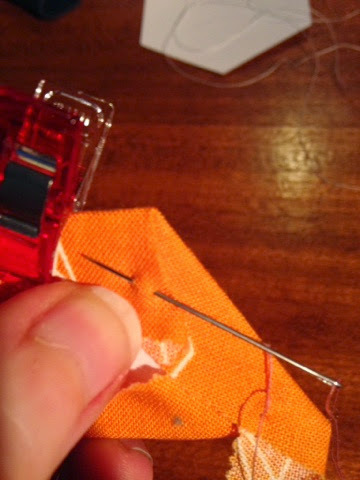 Open the pieces back out so you can see where the next piece needs to join. 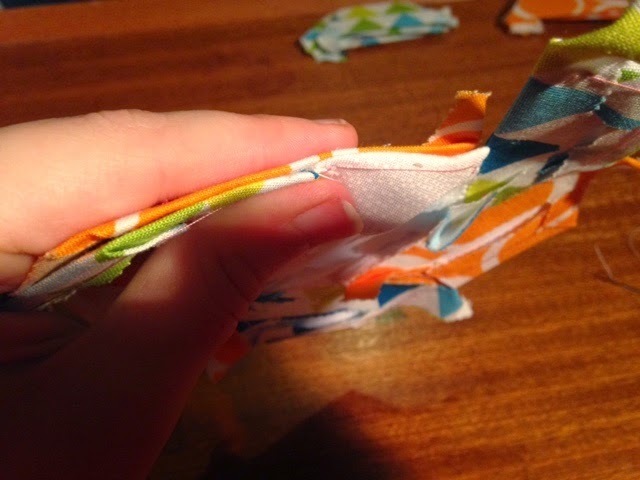 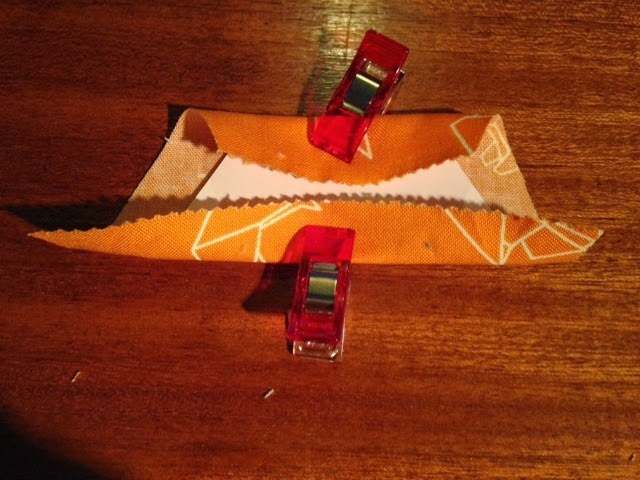 If you fold carefully you will see that the paper naturally folds to create another straight line to sew around, and finish sewing to the edge. 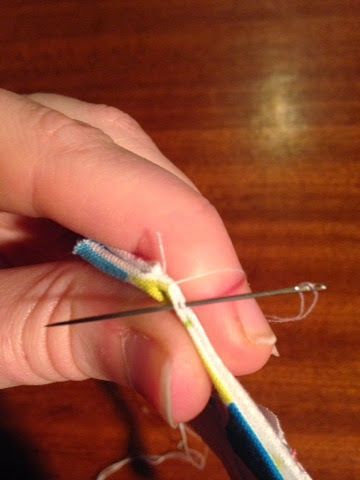 The great thing about sewing them on to the previous ring is you can use the same thread all the way round without finishing off, as where one ends the next one starts. 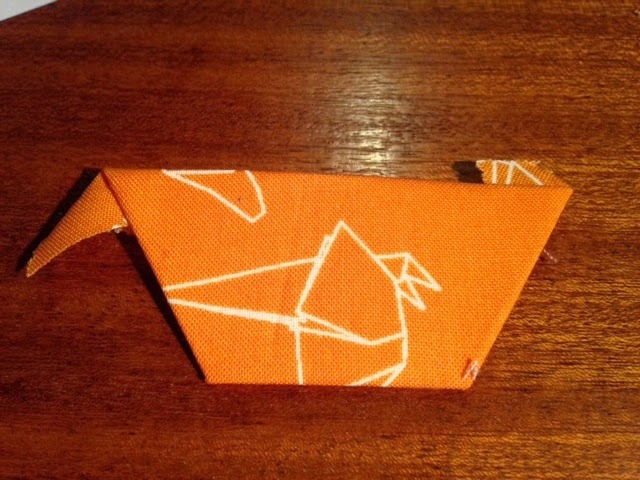 If you have a go I would love to see so please coment below. 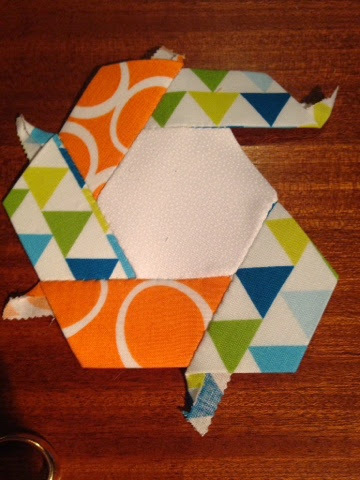 There's a hashtag on Instagram already running #trapiesquilt so please tag.